When you purchase medicines on Universal Care, you can be assured that you will get the medicines you order. Universal Care has the widest range of medicines online, sourced from our trusted network of pharmacies and medical stores. Heavy traffic, lack of parking, monsoons, shop closed, forgetfulness… these are some of the reasons that could lead to skipping of vital medications. Since taking medicines regularly is a critical component of managing chronic medical conditions, it’s best not to run out of essential medicines. 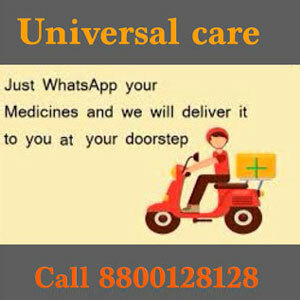 Just log on to Universal Care, place your order online and have your medicines delivered to you – without leaving the comfort of your home. 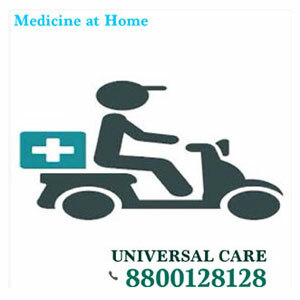 At Universal Care we not only provide you with a wide range of medicines listed under various categories, we also offer a wide choice of OTC products including wellness products, vitamins, diet/fitness supplements, herbal products, pain relievers, diabetic care kits, baby/mother care products, beauty care products and surgical supplies. Universal Care realizes how important your medicines are. So, when you buy medicines online on Universal Care our trained pharmacists, partner pharmacies and medical stores, ensure that your medicines are delivered to you on time, anywhere in India*. Unlike a regular medical store, Universal Care is powered by intelligent systems that remember all the medicines you ordered online and makes sure they're always available whenever you need them. So, you'll always find your medicines on Universal Care online pharmacy, anywhere in DELHI NCR*.